At Pure Nootropics, we do not currently sell any of the CILTeP ingredients or carry the Natural Stacks version, but the concept is important for smart drug users who might add racetams to their stacks. To read a more scientific approach, read Abelard’s post. 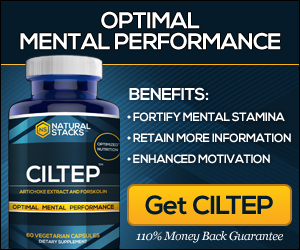 CILTeP stands for “chemically-induced long-term potentiation”, which is a cellular mechanism in the brain responsible for improving memory and learning. The theory dates back to the late 19th century and studies in 2004 pointed towards methods of supplementing to create this effect. PDE-4 Inhibition – the phosphodiesterase-4 enzyme typically blocks signals in the brain (and metabolizes cAMP molecules), which can halt more efficient brain activity. CILTeP works by inhibiting the enzyme. Experimentation by Abelard Lindsay suggests that artichoke extract is the best PDE-4 inhibitor available. cAMP – the cyclic adenosine monophosphate molecule is responsible for regulating countless functions including adrenaline. Increased cAMP theoretically should increase alertness and productivity. Forskolin (an Indian herb) in very precise dosages should increase cAMP production. As the theory and formulation progressed, a dopamine enhancing component was added to provide the additional alertness that made “CILTeP as powerful as Modafinil”. Because dopamine is often helpful for alertness, L-phenylalanine was recommended to the artichoke extract + forskolin combination. There have been a variety of effects of CILTeP (both negative and positive) depending on the person. This is the reason why we suggest cognitive tracking as often as possible. One of the downsides of this combination was exhaustion or tiredness. On the Joe Rogan Experience, Tim Ferriss mentioned how the stack caused him to need 12 hours of sleep the next day. Exaggeration or not, acetyl-L-carnitine helps prevent up-regulation of acetylcholine esterase (by forskolin). When I took the CILTeP stack, I never felt anything related to tiredness, but this was likely due to the acetyl-L-carnitine support and the fact that I consume copious amounts of eggs. Some people cycle CILTeP in order to prevent dependency and to allow the body to recover, though Abelard told me he doesn’t need this. I have used CILTeP on an as-needed basis no more than once per day so I have never experienced a need. The only thing that I would add is a sensation of heat, which I would attribute to the increased dopamine metabolism. Many users claimed the primary benefit of the CILTeP formulation was increased attentiveness and focus similar to that of Modafinil. As I have never tried Modafinil, I can’t comment on the comparison. When using CILTeP, I did notice that my hunger was significantly reduced, which allowed me to be more productive (I cook every meal myself, which is time consuming). This is complete speculation, but I always took CILTeP when in a fasted state (around 14-18 hours) and the reduction in hunger could be related to forskolin’s ability to increase fat metabolism. This disinterest in food may be a bizarre side effect, but it improved concentration on work-related tasks. The acetyl-L-carnitine might be fueling fatty acid oxidation in this scenario as well. While I can’t verify the strength, numerous users in the smart drug community claimed CILTeP was as effective as prescription medication for ADD/ADHD (including Ritalin and amphetamines like Adderall). However, most users identified caffeine as added ingredients to the artichoke extract and forskloin combinations. NOTE: Even though CILTeP is still technically theoretical (with positive anecdotal evidence), the combination with racetams is even less well known. Proceed with caution. The popularity of racetams has garnered some interest for combining different analogues with CILTeP. Because racetams modulate AMPA receptors that involve memory encoding, there seems to be a general synergy. There are few reports, but evidence suggests this works similarly to aniracetam. It causes lethargy, lack of motivation, and over-relaxed sensations in some people. Others claim pramiracetam combines well with CILTeP. Verdict: Mixed. This entry was posted in aniracetam, CILTeP, phenylpiracetam, piracetam, pramiracetam, tracking nootropics and tagged abelard lindsay, CILTeP. Myself, I combine CILTEP with piracetam, and feel that this blend is the near-perfect nootropic. The mix seems to act in a synergistic manner, and provides energy, motivation, a dramatic reduction in brain chatter, and (this might seem a bit contradictory) an overall feeling of calm. Currently, the regime I follow is one capsule of CILTEP and 1.5 grams of piracetam every weekday, first thing in the morning. Weekends are rest days. As a quick sidenote/caveat, the combination of CILTEP with piracetam seems to increase my sensitivity to caffeine, and I can only manage two cups of coffee per day. Anything more than two cups of coffee turns me into a jittery mess for a few hours. Thanks for the feedback. We ALL need this type of feedback to better understand the use of nootropics . What I would suggest to you is that if you add a capsul (open-n-pour) of L-Theanine to your second coffee, it will certainly remove the jittery affect that you are getting from it. It may very well increase the your focus as well. This is such an interesting stack because of how many different people have seen either tremendous improvements or absolutely none at all. Most nootropics seem to have some variation in their efficacy, but this one is literally all or nothing from everybody that I have talked to. I wonder if it is a very specific brain effect that needs to be taken into account. It’s so interesting to discuss the topic with friends who have no / little sensation whatsoever.